Lucio has old friends in the Southern Cone. Funds from the forgery operatives helped hundreds from revolutionary organizations exile and finance clandestine actions against the bloody dictatorships which disappeared ten thousands of activists, students and workers during the 1970’s throughout Latin America. In Uruguay, funds from falsified Citibank travelers’ checks funded the guerilla group Tupamaros, in the US the Black Panthers and other revolutionary groups throughout Europe. During his recent visit to South America, Lucio stayed at the worker run BAUEN Hotel in Argentina’s capital Buenos Aires. He was astounded by the accomplishments of the workers without bosses. At the BAUEN hotel, workers are putting into practice workers autogestíon or self-management. Self-management has been a mainstay of anarchist thought since the birth of capitalism. Rather than authority – obey relationship between capitalists and workers, self-management implies that workers put into practice an egalitarian system in which people collectively decide, produce and control their own destinies for the benefit of the community. Lucio explains that his anarchism is based in his poor childhood in fascist Spain. “My anarchist origins are rooted in my experience growing up in a poor family. My father was leftist, had gone to jail because he wanted the automony of the Basque country. For me that’s not revolution, I’m not nationalist. With nationalism humanity has committed a lot of mistakes. When my father got out of jail he became a socialist. We suffered a lot. I went to look for bread and the baker wouldn’t give it to me, because we didn’t have money. In Spain, fascism persevered 30 years after the end of World War II. Hundreds were placed in jail for resisting the Franco dictatorship. Anthropologists have estimated that from the onset of the Spanish Civil War in July 1936 to Franco’s death in November 1975, Franco’s Nationalists killed between 75,000 and 150,000 supporters of the Republic. Lucio exiled to France where he discovered anarchism. He had deserted the nationalist army and escaped to France. Paris in the 1960’s was a bourgeoning city for anarchist intellectuals, organizers and guerillas in exile. It was there that Lucio met members from the anarcho-syndicalist trade union, Confederación Nacional de Trabajo (CNT). He was anxious to participate. 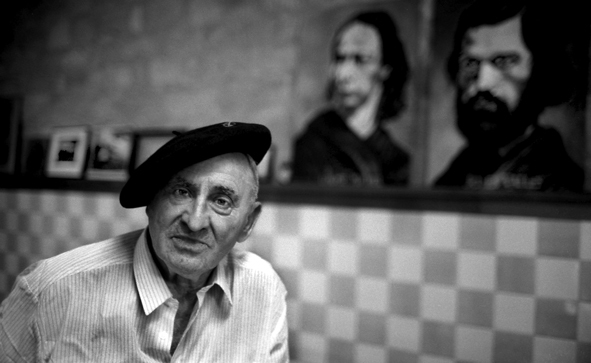 During his early years in France, Lucio met Francisco Sabate, the legendary anarchist and guerilla extraordinaire. At this time Sabate, otherwise known by his nickname “El Quico” was the most sought after anarchist by the Franco regime. French police were also looking for Sabate, who led resistance against Franquismo. “When I met Quico, I was participating in the Juventud Libertarias. They asked me if I could help Sabate, me an ignorant, I didn’t know who he was.” Sabate used Lucio’s house as a hide out. Student organizations and worker organizations received the funds to carry out grass roots organizing. In other cases the money was used for the guerilla actions against Franco’s regime, such as campaigns for the release of political prisoners in the nationalist jails. To save the lives of exiles, Lucio thought of a master plan to falsify passports so Spanish nationals could travel. “Passports for a refugee means being able to escape the country and lead safe lives elsewhere,” he explains. Not only in Europe but in the US and South America, dissidents used false ID’s to lead their lives and direct actions. In 1977, Lucio’s group began forging checks as a direct form to finance resistance. Lucio was essentially the “boss” of the operation-he made, distributed and cashed the checks. The checks were harder to falsify than counterfeit bills. Lucio thought they should target the largest banking institution in the world, National City Bank. The distribution of the checks went to different subversive groups who used the funds to finance solidarity actions. Lucio explains that “no one got rich” from the checks. Most of the funds went to the cause. All over Europe, these checks with the same code number were cashed at the same time. Lucio’s master plan cost City Bank tens of millions of dollars in forged travelers’ checks. But many say a much larger sum was expropriated. City Bank was at the mercy of the forger, who had cost so much that the bank had to suspend travelers checks, ruining the holiday for thousands of tourists. At the time, people did not use check cards or credit cards. Lucio was arrested in 1980 and found with a suitcase full of the forged checks. In the meantime during Lucio’s arrest, Citibank continued to receive false travelers’ checks. Citbank became worried. Representatives from the bank agreed to negotiate. Lucio would be released if he handed over the printing plates for the forged checks. The exchange was made, and Lucio became a legend for his mastermind plan. Although his life as a forger ended at 50-years-of-age, his life as an anarchist continued. Lucio had always worked as a bricklayer. “What’s helped me the most is my work, Anarchists were always workers.” Lucio-bricklayer, anarchist, forger and expropriator has left a legacy like his predecessors. “People like Louise Michel, Sabate, Durruti, all the expropriators taught me how to expropriate, but not for personal gain, but how to use those riches for change.” At 76-years-of-age he does not apologize for his actions. LUCIO from Stuart Christie on Vimeo.